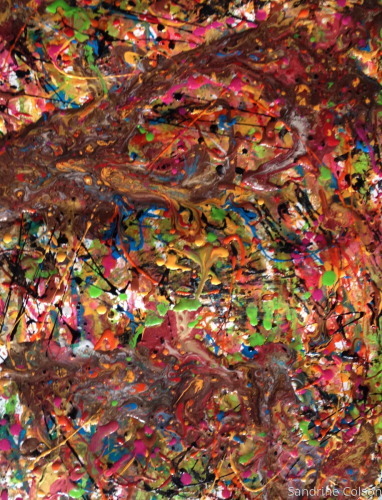 Mixed Media on canvas: ink, acrylic, and enamel paints. Ready-to-hang - no framing required. This piece is part of a series created for the exhibit, “Cosmos: Imagining The Universe” at the Annmarie Sculpture Garden and Arts Center in Maryland. I created three pieces entitled “Beginning 1”, “Beginning 2”, and “Beginning 3”. These mixed media pieces show the birth of a new universe, a new beginning. Starting from a more familiar view of galaxies (“Beginning 1”) that are combining with each other (“Beginning 2”) to result in an explosion of a new big bang or the formation of a new universe (“Beginning 3”), where nothing is none and all is left for the viewer to imagine as a new beginning. 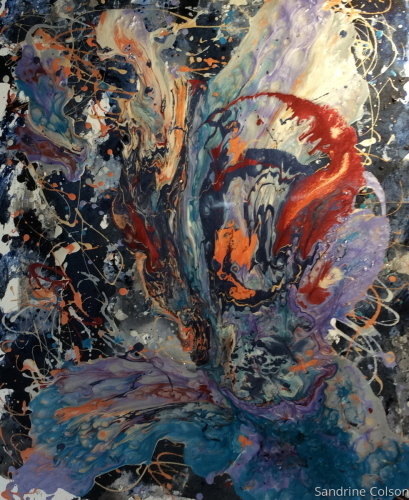 In terms of the process, I combined mixed media (inks, acrylics and Pebeo enamel paints), inspired by my science background and played with effects of light and colors using dark colored inks and acrylic paints with alcohol splatters to represent the farthest unknown parts of the universe, leaving empty space on the canvas to create depth and mystery. 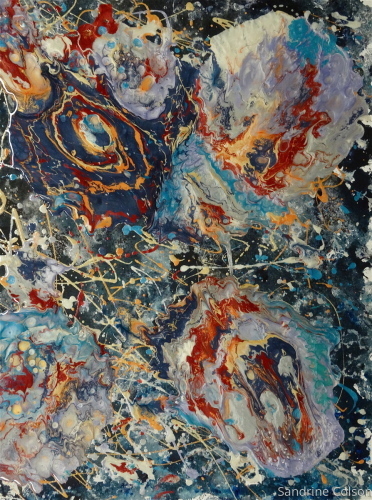 I, then, added twirls of Pebeo moon (or prism) enamel paints purposely mixed in selected colors to give an impression of changing or transforming galaxies that resulted in the beginning of a new universe (or life?). 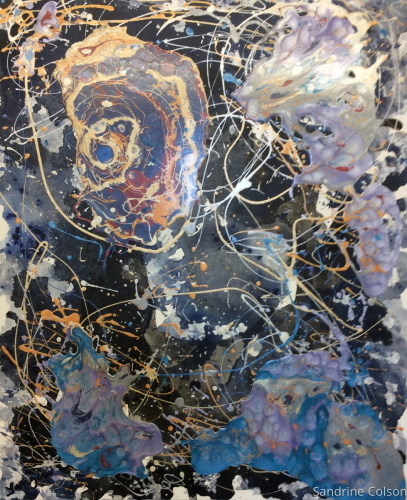 In this piece, I was inspired by my science background and played with effects of light using dark colored ink and paint with empty space from the white canvas or added alcohol splatters. I, then, added, twirls of Pebeo moon paints purposely mixed in selected colors to give an impression of the beginning of a new universe. Association with the Smithsonian Institution. In this piece, I was inspired by science and played with effects of light using dark colored ink and paint with empty space from the white canvas. 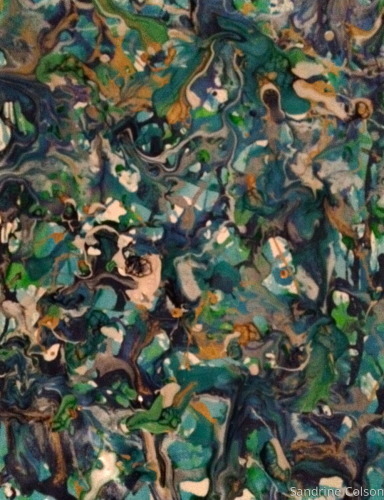 I, then, added, twirls of Pebeo moon paints purposely mixed in selected colors to give an impression of the beginning of possibly life or time. 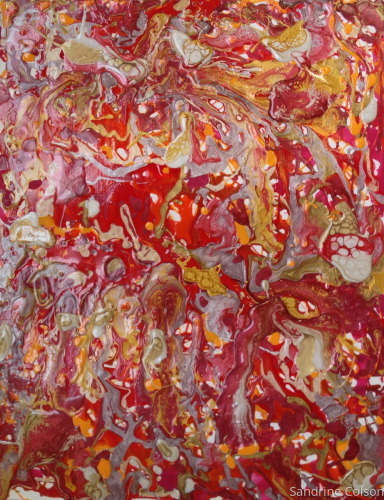 Mixed media on canvas paper: Acrylic and enamel paints. Image is 16" x 20". Framed. Acrylics and enamel paints on canvas paper. Image is 11" x 14". Framed. Acrylics and enamel paints on canvas paper. Image size is 11" x 14". Framed.